A rock climber without safety ropes, Alex Honnold rises to the occasion of his greatest challenge with only a bag of chalk to keep him steady. Who knows what makes mountain climber Alex Honnold—the daredevil at the heart of the so-terrifying-you’ll-hyperventilate Free Solo—risk his life thousands of feet high without ropes or securing gear of any kind. Maybe it’s a quest for perfection, or a death wish, or a unique biological inability to feel fear, or a pursuit of the “goddamn warrior spirit” (his own words). All of these possibilities are suggested during the documentary’s running time, but in a way, you won’t want him explained. Just like the sheer rock face El Capitan that looms like a one-kilometer-tall challenge, Honnold himself is a force of nature: shy, prone to solitude and potentially on the spectrum of autism. He memorizes the complex moves in his climbing journal and waits for the right moment to head out, and up. 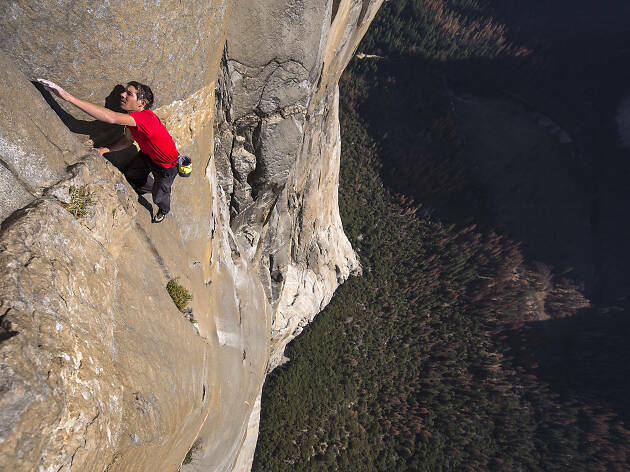 Already a gripping watch, Free Solo becomes extra special when it widens out to accommodate the people hanging on to Honnold’s vertical trajectory. We see him transition from a dude living in a van practicing pull-ups and frying up a mess of eggs and potatoes to—what’s this?—becoming a love object to a doting girlfriend. Sanni McCandless takes huge emotional risks in getting close to Alex, who might die because of a single misstep, but his evolution through their relationship is heart-meltingly romantic—and ominous. Will it destroy his concentration? 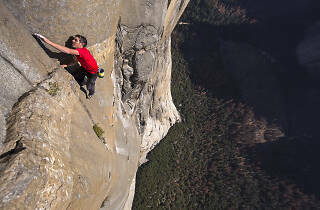 Meanwhile, a crew of rappelling cameramen, led by co-director Jimmy Chin, wrestles with its own ethical questions. Are they enabling decisions that could result in a fatality, all for the sake of a movie? Free Solo is about getting dangerously close to the edge, where some people feel most alive. We get to experience that thrill secondhand, and that’s enough.